One maxim of digital transformation is that all work able to be done by a simple digital process will be quickly absorbed and optimized by the sector’s top competitors. Every time a human intervenes in a production process and has to search for, investigate, or introduce a datum, the process slows down, and becomes sub-optimal. The larger the company, the larger the problem: there are hundreds of administrative, control, entry, bureaucratic, data input and output processes entailing millions of instances of lost efficiency. Efficiency is achieved when an organization secures a comprehensive, automated system that minimizes the need for human intervention and allows for data to move in each stage of the journey. A system like Lantek’s. In the vast majority of factories, so-called "information islands" are often created. These are functional working systems isolated from the company’s other functional systems. Very little data and even less information flows from the workshop to the technical office, or between different workshops and production lines. The flow of information between the sales office and production areas is even scarcer. In the end, when executives request information to make decisions, the data are often difficult to extract and wind up being inconsistent. Lantek offers a system of products that share data so that the process is fully traceable: from quote to manufacturing order, from nesting to job planning, from inventory to assembly, from delivery of the finished product to billing. Paper and hassle free. Large cost centers for factories include man-hours, raw material consumption, and machinery efficiency. 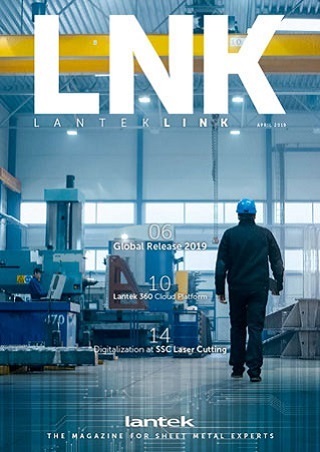 We’ve already discussed how the Lantek system dramatically reduces raw material consumption as well as the necessary man-hours by automating all non-production processes. Now let’s focus on machinery efficiency. It isn’t a secret that a factory’s profitability lies in its ability to maintain high production efficiency. Availability, Performance, and Quality, are the three OEE indicators for each machine, line, and plant. They are the objective of all production process managers. If it isn’t measured, it doesn’t exist. The ability to have an OEE for each machine, each line, and each plant for any period of time and to see their evolution over time allows alterations to be found and causes or explanations for any variations to be sought out. Do you plan production on a spreadsheet? Lantek companies are able to plan production at several scales from the MES. What’s more, they can have a system that analyzes workload, availability, and efficiency, and also automatically proposes plans with smart efficiency algorithms. Simple, fast, efficient. No delays. No procedures on paper or depending on data being input. From receipt of the manufacturing order until the order goes out to the customer and a bill is sent, this is an uninterrupted automated process, regardless of company size or previous computer system. All the information about the goings-on, available on your cell phone. Notifications for each machine shutdown, workloads in progress and pending, real-time status. Control and information to make effective decisions instantly. And not (just) for the sake of environmentalism, but rather because paper is inefficient. How much paper is there at your company right now? Do you still print your daily production plan? Do you still use paper delivery notes or manufacturing orders? Do your operators still have to fill out paperwork that another person then has to introduce into the system? It doesn’t take a great deal of analysis to understand that this is inefficient. Each of those steps entails a loss in efficiency and an increase in the possibility for error. Each time a piece of data written down is then input into a system is an opportunity for that piece of data to be entered incorrectly, thereby vitiating the collection of useful information. Quoting, inputting manufacturing orders, planning, nesting, production in the workshop, inventory, shipments, validations, billing... all of this on a single system, all paperless, all from different devices and for different users. Can you calculate how many errors you could prevent and how much time you could save in a factory like that?